When you're in the midst of a bathroom design project, you're probably going to sift through your fair share of interior design magazines to find a scheme that works for your home. Many people love the rustic style of decorating, as it provides a warm and calming atmosphere that draws nature indoors. A bathroom vanity is the focal point of your bathroom, so choosing one to adhere to your rustic theme is actually quite simple. Look for the natural finish of solid wood in these furnishings, as this can combine seamlessly with the other decorative accents that define the theme. Wicker baskets are another important addition when working with a rustic scheme, so use a few as storage behind your toilet for magazines and newspapers and a smaller basket on top of your bathroom vanity to hold toothpaste and other toiletries. 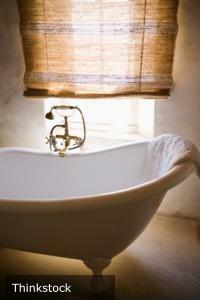 Lastly, don't forget about the inclusion of touches of green in your bathroom. A few carefully placed potted plants and ferns on your vanity or on a window sill can help to add natural decorations to your bathroom and create a peaceful vibe at any time of the day.